Finally, after a blazing hot and miserable summer, September had arrived and it was time for the Flags on the 48. 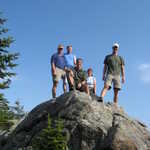 I had spent a good amount of time planning the trip, and I had a committed group signed up to hike with me. My companions consisted of Dome, Paul, and Steve (who actually watched the Twin Towers fall and lived to tell about it). 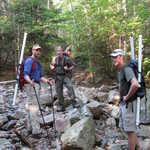 This year, everyone was up for a great hike, and when the day came, we all had a palpable level of excitement. 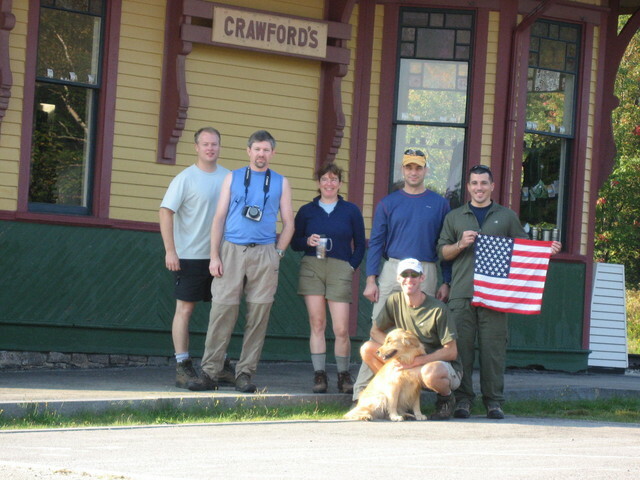 We arrived at the Crawford Depot at about 7:45 AM (which for me was a miracle in itself!). 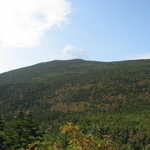 Our plan was to hike the Avalon trail up to Mt. Field, stopping to admire the promised views from Mt. Avalon, then take the Willey Range Trail to Willey. 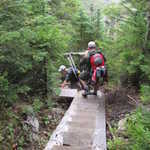 After flying the flag from noon to 2:00 PM we would continue South on the Willey Range trail, meet up with the Ethan Pond trail and complete our hike down the Kendron Flume trail. This route provides an excellent variety of scenery and environment, but requires a car spot, so we asked Steve to park his car at the Willey House, which is conveniently located at the end of (or the beginning of) the Kendron Flume trail. 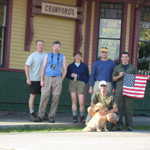 When Dome, Paul and I arrived at the Crawford Depot, Steve (with the help of Tom and Laurie, who were covering Mt. Tom) were already there and enjoying their trip preparations. The temperature was still cool from the night before, but the sun was warming things up nicely, so we got our pre-hike picture taken, and we moved as one motivated group onto the trail, which is directly behind the Crawford Depot. I had traveled this same route earlier in the year, while there was still snow on the ground, so I was very curious to see how the trail would be different in warm weather. The Avalon trail begins the way every trail should (but doesn't); nice and gradual. We were all able to warm up on the slight incline and conversation was not a problem. Footing is excellent and the grade increases only slightly over the next mile or so. The Beecher and Pearl Cascades appear fairly quickly on the left (South) side of the trail, and despite the fact that we did not stop (we had a schedule to keep) are very much worth the extra few minutes. 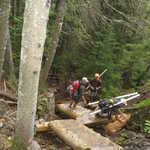 In fact these would be a great short hike for a family or group of "non-hikers". Before long, we reached the junction of the A-Z Trail. 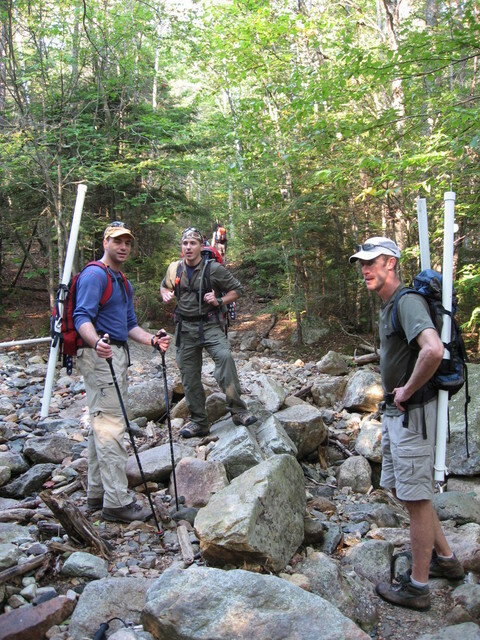 We met a few hikers here, none of which, to our surprise, asked about the 5 foot long poles sticking out of our packs. I guess people are use to anything. 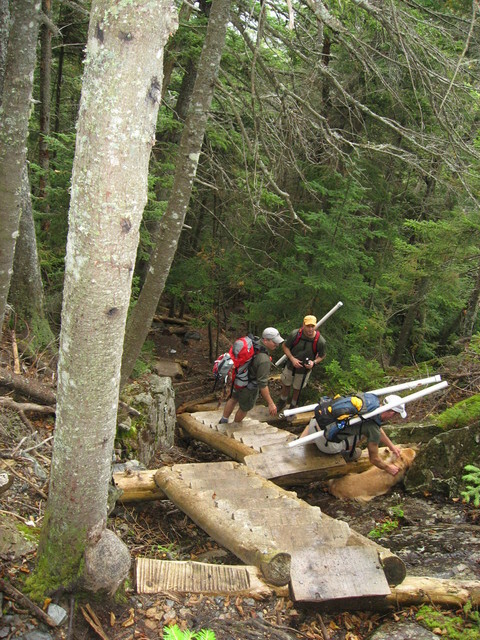 We continued on the Avalon trail and about another 10 minutes later the trail began to climb in earnest. Steve was a little unsure of the steep sections, since he hadn't hiked a 4,000 footer before, but he took it in great stride and kept moving without so much as a single complaint. 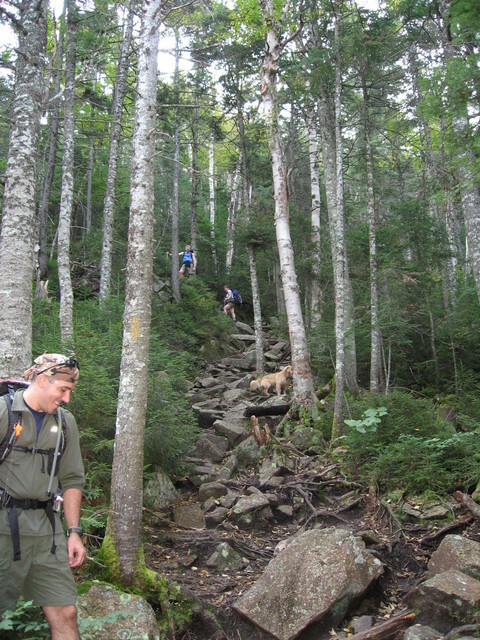 The trail continues at an extraordinary steep pitch until it reaches the Mt. Avalon spur at almost 2 miles. We checked the time to make sure we had enough room in our schedule to bag Mt. Avalon, and to our surprise, it was only 10:00. We had pretty much matched book time, despite a few rest breaks along the way and lots of conversation, so we dropped packs and worked our way up to the summit of Mt. Avalon, which was small but spectacular! We had a very clear view to the East and South and could clearly see the Highland Center and Crawford Depot. With Tom's 300mm lens, we could even see our cars in the parking lot! Before too long, we packed up and hit the Avalon trail towards Mt. Field. Our hope was to make it to Willey by 11:30 and a long delay would jeopardize that schedule. 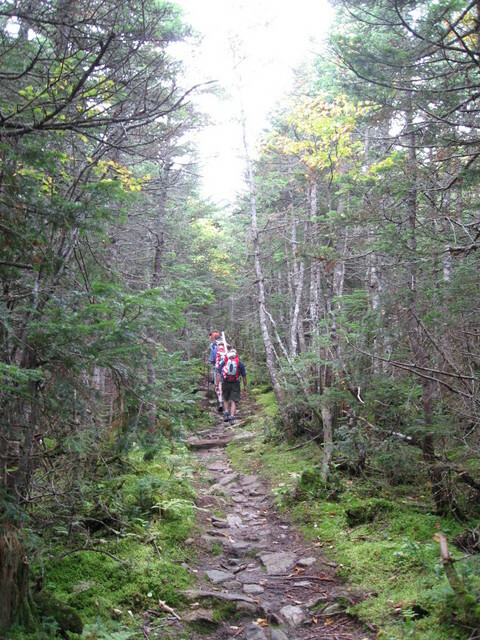 From Avalon, the trail maintains excellent footing but returns to its previous, moderate grade. There is a nice saddle between Avalon and the base of Field that holds some beautiful flora and should not be ignored. We stopped briefly to check out the trail ahead but moved on after snapping a picture or two. At the base of Field, the grade increases slightly and signals the beginning of the end for anyone planning to end their trip on Field. We moved briskly up the side of Field, which was about another 1,000 vertical feet, with surprising energy. It's amazing what the promise of the next summit will do for some tired legs! At about 11:00 AM we arrived at the summit of Mt. Field and celebrated Steve's first 4,000 footer! 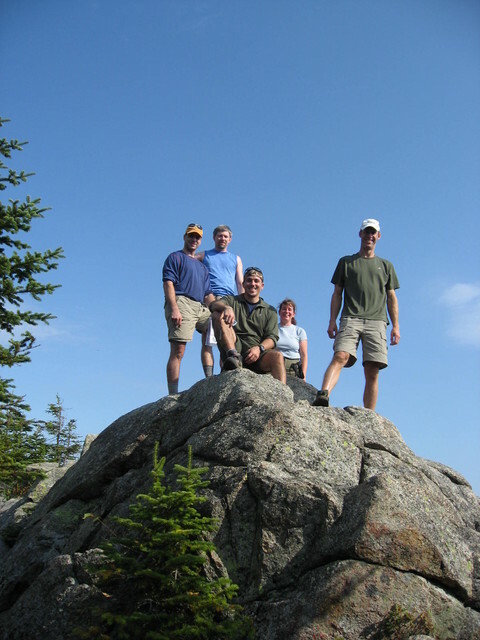 Field's summit is not above tree line, so there are only a few places to catch some scenery. The weather had begun to deteriorate at this point, which made our views even more limited. We could clearly see Mt. Avalon and beyond down to the Highland Center. 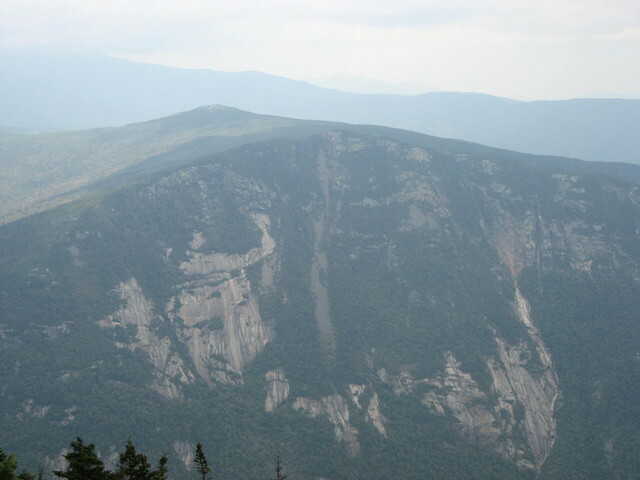 The best views are to the East and several other peaks are visible including Pierce, Jackson and Webster. After a short rest at Field, we felt that we should move on and get our flag flying. 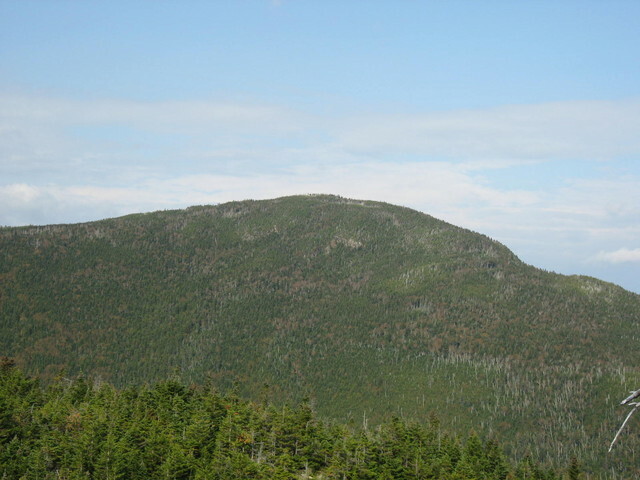 We began the moderate descent into the saddle between Field and Willey. 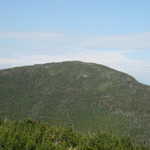 Between the two peaks, the flora has that familiar but unique quality of splintered sunshine, moss, evergreen and wood bark. I find that this environment can't be found in any other place except at this elevation and is one of the rewards of hiking to 4,000 feet. 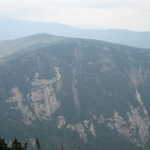 The Willey Range trail continues its descent and wraps around the western side of the ridge before beginning the moderate ascent to Mt. Willey. At almost exactly 11:30 we arrived at the summit of Mt. Willey and began to set up our tribute. 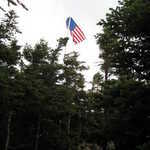 Willey is another tree-lined summit, which was ok with us because it gave us many options for anchoring our flag pole. 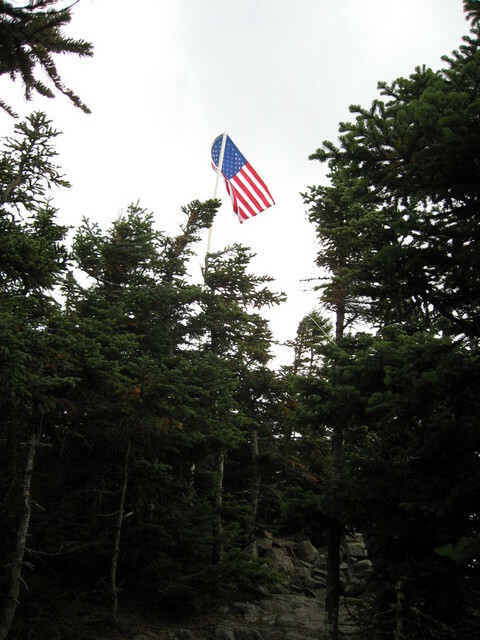 We all worked together to find a solution to securing the flag and before we knew it, Old Glory was poised a good five feet above the trees and hopefully visible from some of the other peaks in the range. We took some pictures and moved on down the trail to the outlook, which afforded spectacular views of Webster (includng the Webster Cliffs) and Jackson, and in clear weather Pierce, Eisenhower, Washington, Monroe, Jefferson and even Isolation. We sat down to enjoy the scenery, snap some pictures and wait out the two hours that made up the memorial. Before long, we had some visitors who indulged our stories about the event and why we were flying a flag. We answered lots of questions, were thanked many times and were generally treated very respectfully by everyone we saw. At 1:30 the weather fell apart completely and the rains came. We decided to end the day a bit early, amid some serious guilt, but the forecast predicted thunderstorms so we had no reservations about getting our 20 foot flag pole/lightning rod off the peak. Breakdown took only a few minutes, and by 11:45 the Willey crew was on the way off the peak and heading towards the Ethan Pond trail. Almost immediately the trail begins a very steep descent. 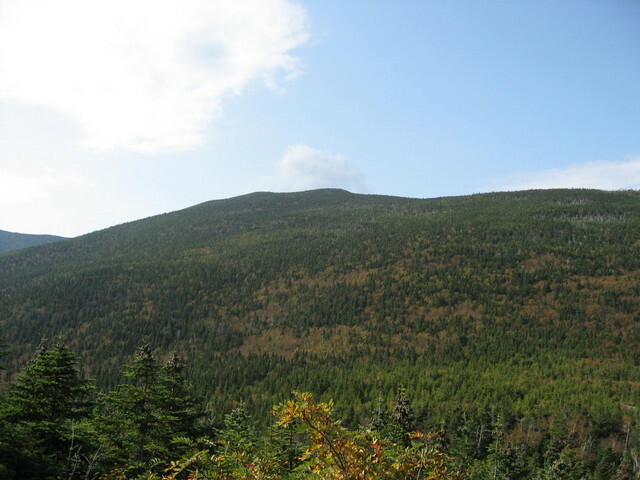 We knew this by reading the White Mountain Guide and the decision to ascend via the Avalon trail proved to be the right one. 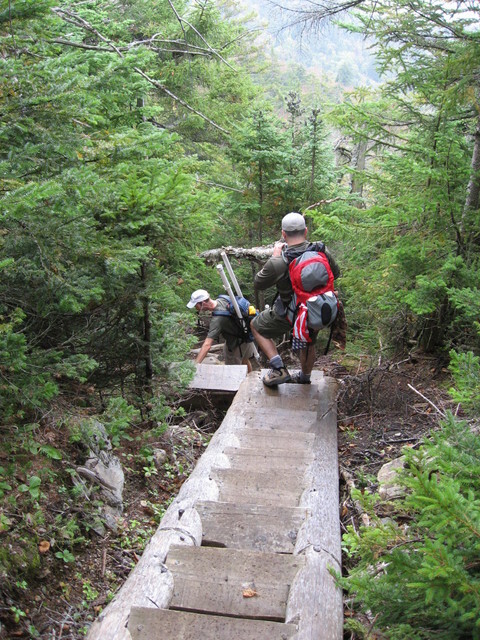 At points the trail gets so steep that stairs have been built into the trail to ensure fewer injuries. Without these stairs, travel through this section would be next to impossible, so we were very grateful. The steep grade persists for almost a mile before leveling out and meeting the Ethan Pond trail. Less than a half mile later over moderate grades the Ethan Pond trail meets the Kendron Flume trail, which diverges to the East (left) and quickly turns North, then begins another descent. 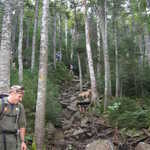 Before long this trail also takes a fairly good turn downward and the grade becomes steep once again. The group made many references to how glad they were that we were going down this route rather than up, and I certainly agreed. About one mile after leaving the Ethan Pond trail, the Kendron Flume appears and it well worth a stop. Views of the Webster Cliffs are available here, but are trumped by the beautiful cascade. We spent a couple minutes here, but moved on before too long. The last mile crosses some railroad tracks, then descends to the parking lot of the Willey House. Our trip down took about 2 hours total, with several stops and slow downs to allow my knees to stop screaming. We could have made it quicker, but doing so would have felt a little like we were trying to get off the mountain, which we were definitely not. Our memorial hike was a great success. We lead a friend to his first and second 4,000 footer, saw some amazing views, and paid tribute to our nation and those who so senselessly lost their lives. 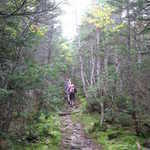 Despite the weather, this was a very fun hike, one that provided several excellent rewards for the effort.